CUCET 2019 Application Form: The last date to submit the application form fee payment has been extended to 22nd April 2019. Candidates shall be able to modify the application from 21st April 2019 (10:00 AM) to 23rd April 2019 (10:00 AM). Appearing candidates will be required to fill and submit the Application form. But before filling an application form an applicant needs to register. The registration process has started on 13th March 2019. Only the registered students will be allowed to fill an application form. The last date to fill the form is 20th April 2019. Candidates can visit the official website to register online. The application form of CUCET 2019 has to be filled with correct details. Candidates also need to upload scanned images in their respective application form. The concerned authority will accept applications of only registered candidates on or before the given last date. Candidates also have to pay a certain amount of application fee. All applicants looking for CUCET 2019 application form dates, the procedure to fill, application fee, etc., can check the information in this article. The last date for making payment of the application fee has been extended to 22nd April 2019. The registration process of CUCET 2019 has started. Register for CUCET 2019. To appear in the Central Universities Common Entrance Test, it is mandatory for all candidates to fill and submit the CUCET 2019 application form. The application form is available from 13th March 2019 till the last given date which is 20th April 2019. It is available online on the official website as well as here. Applicants must fill the form with correct personal and academic details. Candidates have to upload the scanned images of their photograph and signature a well. Without the payment of CUCET 2019 application fee, the application form will be incomplete. Aspirants can pay the application fee online by credit card or debit card. One can also pay the fee offline by downloading the e-challan and depositing the fee at any SBI bank branch. The Person with Disability (PwD) is not required to pay any kind of application fee. Candidates can check the CUCET 2019 application form dates given in the table below. Follow the steps given below to fill out the application form of CUCET 2019 easily. Registration and Login– Candidates must first visit the official website and register themselves. For registration they have to furnish details like application id and date of birth. On successful registration, a login ID and password will be sent to the candidate email Id. Filling up the form – Using the login Id, applicants have to fill personal, academic details, select the exam center and course. Upload images – In this step, students have to upload the scanned images of their photograph and signature. After uploading the scanned images, read the content of declaration box and select “I Agree” option. Payment of fees – CUCET 2019 application fee has to be paid in the online mode or through e-challan. The application fee will vary according to the category of the candidate. Submission of form – After checking and reviewing the details in CUCET 2019 application form, applicants must submit the form. A PDF file of the filled up application form along with the uploaded images will appear on the screen. Applicants are advised to download the PDF and take the print out of the same for future use. The candidates who have filled up the application form of CUCET 2019 will be given another yet last chance to make changes to some of the wrong details entered on the application form, in case of any. The CUCET 2019 application form correction window will be opened in the fourth week of April 2019. Request for change/edit in any field in the application form will not be entertained under any circumstances once the correction window is closed. Therefore candidates must enter the details carefully while filling up the application form and also make use of the correction window to check if there is any incorrect detail entered. Before applying for the exam, every candidate must make sure that they fulfill all the CUCET 2019 eligibility criteria. The eligibility criteria are based on certain parameters like age, educational qualification, etc. Check the full CUCET eligibility criteria here. Nationality: Applicant must be an Indian citizen. Qualifying Exam: Candidates must have passed 10+2 qualifying examination or equivalent examination conducted by CBSE or equivalent boards. 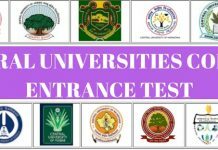 Candidates appearing for 10+2 examination in the year 2019 can also apply for CUCET 2019. Minimum Marks: Secure minimum 50% marks in aggregate in 10+2.